As of last week, things were pretty-well squared away for the upcoming start of my new life in Montréal: I'd found a place to live. I'd met more of the faces around the department. I'd taken care of basic errands around the university, picking up my student card and figuring out how wi-fi access and the campus printers work. I'd registered for classes for my upcoming first term as graduate student. With business more-or-less taken care of--and with courses not starting until the day after Labour Day--I felt entitled to run off and spend the final week of August back here in Québec City. By intention or by accident I wound up at the sites of several class field trips from my days of French-language integration. That 19th century prison that has been transformed into a present-day wing of the Musée national des beaux-arts has even further transformed an area within the cell blocks into a cafe. Though it hadn't specifically been on my list of places to return I wound up making a couple trips back there this past week. Ironically, given the building's history, I chose it as somewhere to place myself in a pleasant setting where I could focus on cramming for my upcoming Arabic placement exam. 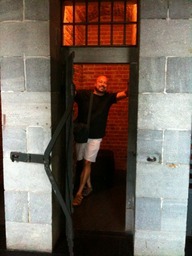 Somehow, the cell-block cafe was the perfect place for my review. Since our class toured the parliament building on a field trip at the beginning of the year I'd planned to return one day. My desire was less to walk again through the halls of provincial government so much as to take lunch there. I'd heard that the cafeteria in Québec's seat of government offers a typical, traditional Québecois menu at good value. I finally got around to sampling that, meeting up with Annie one afternoon over the lunch hour of her day job right there at the National Assembly. My choice amongst the three set menus of the day was: a main course of pâté chinoise, a side of chou bruxelles (brussels sprouts,) pouding chômeur for dessert, and a cup of mint tea. Good grub at a good price ($10 CAD.) Why didn't I take lunch there far earlier? 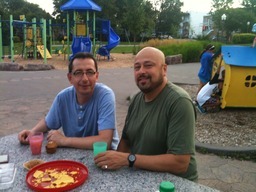 Another day I picnicked in a neighborhood park with Colombian couple Andres and Rosa. The venue wasn't a place with special significance to any of us but chosen as a point in-between our apartments, a place that would have playground equipment for their young children to enjoy the time while we adults socialized. It felt good to say a more personal farewell to them, in-particular. They were the classmates I connected with the best--perhaps as we were all of a similar age. Despite that I'll be running off to live in an entirely different city, we all have similar plans for the immediate future. They'll both perpetuate their studies at university, too. 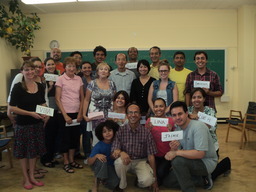 They'll continue along the track where we first met, improving their French at Université Laval. Though my studies have detoured on to Montréal and on to other languages, all three of us happen to start up school again on the same day next week. Multiple bakeries were on my list of places to revisit: La Fournée Bio in Limoilou (for their muffins aux trois chocolats.) The branch of Paillard on Rue St. Jean (for their jésuites.) It was at the latter I sat outside on the terrace alongside the pedestrian corridor one evening with Siliu, the friend I've met up with more than any other since back in Québec City. On one occasion she asked if we could visit Lévis, the town set just across the St. Lawrence River from Québec City. She'd never been. As she'd only recently got her driver's license she wanted to go out and take a spin somewhere different. It was easy drive from our Wedensday conversation cafe over the bridge to the other bank of the St. Lawrence River, finished with a 10-minute ferry ride back across to Québec City. 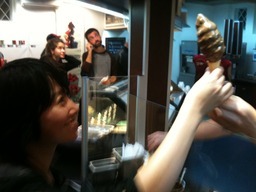 It had been over a year since my first French class went on our field trip to Lévis, but I still remembered how to make my way up to the beloved chocolate factory and ice cream shop set up at the top of the hill. Another evening was spent at a local community center attending an informal French conversation session that I went to every week for a period of many months. I started attending last autumn when I had nowhere outside of class to develop my spoken French skills. It was there that my ability to converse was really kickstarted. My fluency gradually increased to a point where I got less out of the sessions; I eventually told them I'd be attending less frequently--though I never did stop going entirely, even in the mad days of the intensive FLÉ summer sessions. While back in town, I wanted to engage in the conversation circle one last Wednesday afternoon and say goodbye to the volunteers (mostly retired French teachers) running the sessions. Tomorrow, a farewell party has been organized by a classmate. 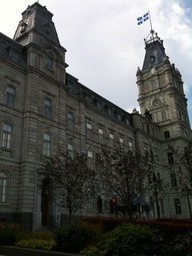 It's been a good, proper goodbye to the people and places that have become dear to me in Québec City. Though from the day after tomorrow my residence will be in Montréal, I know I'll return sometime sooner than later. There are so many people and places I've grown so fond of over my time living here.